I had a fun Jazz Night Out when I saw the Danny Bauer Trio play Jazz Wednesday at Brothers Drake on Wednesday the 24th. The first set was a mix of Thelonious Monk classics and originals reminiscent of Monk’s style. “Evidence” served as a warm and enticing opener, highlighted by Marty Quinn’s high-ranging and propulsive bass solo. The contemplative “Panonico” found Bauer on a sparkling stroll across the keys that climaxed with an unaccompanied piano finale. Drummer Ryan Folger was featured on a New Orleans-inflected “Bemsha Swing” that scaled up into a breathtaking journey through alternating structured and free passages. “Bright Mississippi” also changed its colors while it was performed, opening with a Folger solo and shifting to an off-kilter Latin-tinged section before building to a funky jam. The original material was thoughtfully rendered, as Quinn contributed a couple of nuanced originals and Bauer’s “Makin’ Like Monk” was a note-perfect homage to Monk’s soulful theatrics. The trio sounded great Wednesday, so I recommend catching them whenever you get the chance. Make special effort for Bauer and Folger – they were both recently accepted to masters programs at the prestigious University of North Texas, so the days left in their current Columbus stints are limited. Congratulations guys! Thursday, March 3rd (9:30pm – 12am): Descendre at Carabar. Guitarist Stan Smith’s Thursday night “honest music” series continues at the Olde Towne East bar with his all-star fusion quartet. Smith is joined in Descendre by keyboardist/multi-instrumentalist Lisa Bella Donna, bassist Jim Tussing, and drummer Justin Campbell. These shows have no cover, are open to music fans of all ages, and there is tasty food available until midnight. This is a great opportunity to see four of Columbus’ best explore new sonic realms in a relaxed environment. Saturday, March 5th (7 – 9pm): Kelly Crum Delaveris at Bungalow Jazz. Delaveris, one of Columbus’ finest vocalists before moving to Pennsylvania, is returning to town this weekend and will be playing a few shows. She will be joined Saturday by an evergreen band of Mark Rubinstein (piano), Andy Woodson (bass), and Jim Rupp (drums). After a two month+ Winter Break, this show will be the first at the Bungalow in 2016, so this gathering of luminaries for an evening of straight-ahead vocal jazz should be quite a spirited return to action for the venue. You can also see Delaveris perform a program of tunes from the movies and TV with Richard Lopez at the Columbus Museum of Art on Sunday at 3pm, as Lopez detailed in his recent interview. 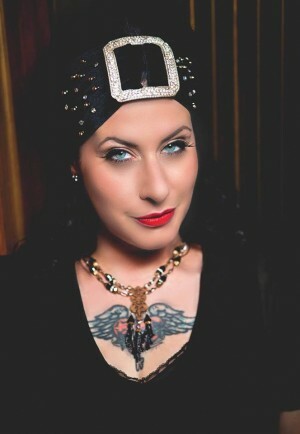 Wednesday, March 9th (9pm – 11pm): Davina & The Vagabonds at Natalie’s. Hailing from Minnesota’s Twin Cities, this musical melting pot of jazz, blues, soul, roots music, and more will storm through town on Wednesday night. The band is known for its energetic live shows, and its influences are said to range from Fats Domino and the Preservation Hall Jazz Band to Aretha Franklin and Tom Waits, so this performance is sure to be filled with thrilling peaks and valleys of all descriptions. Table seating has already sold out – standing room only tickets are available here while they last.